Don’t be fooled by cheap prices you see when you first search for 5kw solar systems online. You will noticed ads for $4000 – $6000, but these are bottom of the barrel junk systems that are going to prove to be a giant waste of money 5 – 10 years down the track when their Kwh output drops to nil. If this is the first article you have read about system sizes and prices, then I suggest you do your research. There are a lot of scammers out there and quite a few low quality or “junk” solar systems out there. You might save 20% initially of the price of a fully installed 5kW solar system, but you will pay in the long run as your system will rapidly reduce its output, totally negating the long term benefits you stand to gain by getting solar installed. 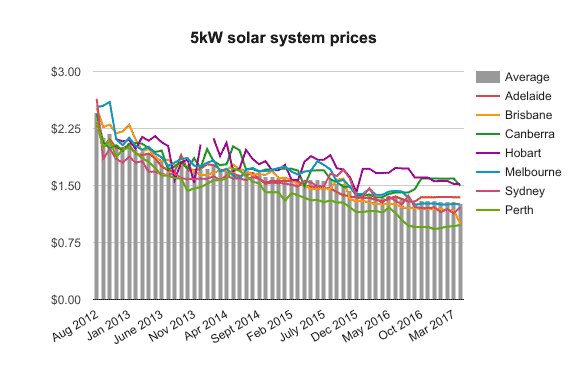 Below is a graph of how the average price for 5kW solar systems has changed over the last decade. 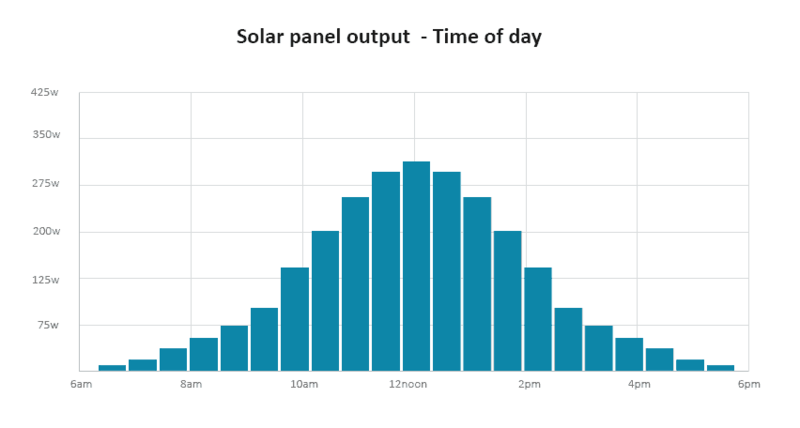 How is a solar panels performance rating calculated? What can I run with a 5kw solar system? How much does it cost to install a 5kW solar system? Is a 5kW solar system worth installing? The wattage a solar system will produce depends on the quality of the panels used. Most solar panels in 2019 are 1650mm x 1000mm. Each panel will produce between 290 and 360 watts of power. But on average 320 watts. As time goes on solar panels are getting more and more efficient at turning the suns light into electricity. 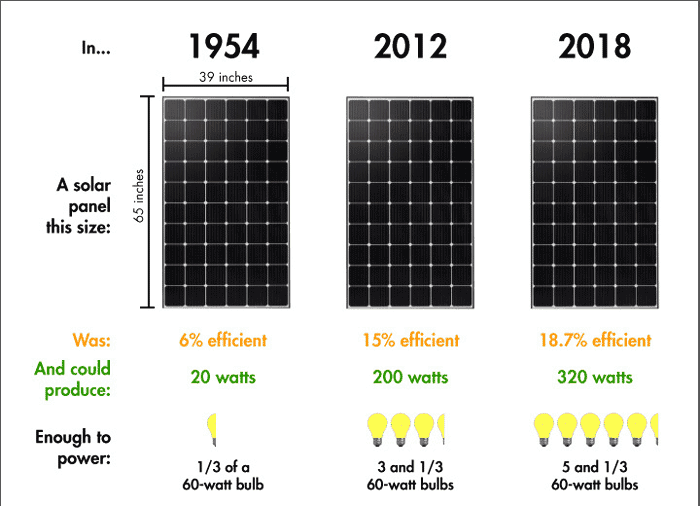 They rate panels on efficiency and over the last 50 years they have gone from 6% efficiency to up to 23% efficient. The average residential solar panel is about 18% efficient. With the above information we can determine how many panels you will need to make up a 5kW solar system. On the back of each solar panel you will find a label that looks like this. It indicates how much power they will put out in “ideal conditions”. The test is called The Standard Test Conditions (or STC for short). The test is carried out by exposing the panels to 1000 watts of sunlight per square meter of surface. That is about the peak sunlight you will get a noon on the equator on a blue sky sunny day. You can see the above panel is rated at 250 watts which means it will put out a full 250 watts of electricity when exposed to full sun for 1 hour. With 4 of these panels you will produce 1 Kilowatt of power. For a 5 Kilowatt solar system you would need 20 of the above panels. We have no affiliation with the below companies and are showing these panels based on their high quality and watt STC indicated by the companies themselves. Your typical 5kw solar system will use 15 – 20 panels. The number depends on the wattage output as discussed above. So for example and 250 watt panel will require 20 panels (250W x 20 = 5000W/ 5kW). A better quality solar panel such as an LG High NeOn R which produces 365 watts would only require 14 panels to have an output of 5kw per day. A 5kW solar system is designed for a medium sized home with 3-4 people living in it. This would cover you for all your alliances that idle such as your refrigerator, hot water and Wi-Fi, as well as other items you use at peak times such as a dish washer, washing machine, toaster, TV etc. You panels will only be of use to you during the day when they are generating electricity. Most households use most of their electricity at night, so it is worth considering also installing a solar battery so save power generated through the day for use later on in the evening. Visit here for more information on power usage for alliances. The price of installation of a 5kw system is included in the price of their quoted price for a 5kw solar system. It all depends on the equipment used. By equipment I mean the quality of solar panels and inverter used in the system. Some companies will try to talk you into a cheap system so they make more overall profit. As they are getting the equipment on the cheap, they can charge more to install and you still save money overall. In reality you are actually losing because you system will generate less electricity as the years ware on and you will be forced to replace it within 10 years. Do your homework and make sure you are getting good quality solar panels and inverter installed for a decent price. If you live in a medium sized home with 3-4 people then the answer is an enthusiastic yes! With the rising cost of electricity in Australia and no signs of it getting any cheaper, the cost installing a solar panel system with government rebates means you will have it fully paid off in just 4-5 years and will enjoy up to 80% off your power bill for your troubles for the following 25 years minimum. I would say it is only worth it if you plan on living in your current location for more than 10 years.